The Hudsucker Proxy, 1994, (111 min) Directed by Joel and Ethan Coen. 8 seconds from Scene 15 looped. Jurassic Park, 1993, (127 min) Directed by Steven Spielberg. 8 seconds from Scene 61 looped. Courtesy of Thatcher Projects, New York and TORCH Gallery, Amsterdam. Stilleben mit Schinken (Still Life with Ham), 1635/2014. original at the Alte Pinakothek, Munich. Commissioned for "There's a Hole in the Sky", curated by Tom Polo at Campbelltown Arts Centre. Courtesy of the artist. —> Download a PDF of the accompanying publication here. Acid connotes the fragmentation of experience and dislocation of meaning due to un-structuring effects on thought patterns. Gothic – traditionally a response to the classical – could be said to remain non-, anti- and counter- by definition, always asserting that the conventional values of life and enlightenment are actually less instructive than darkness and death... with classical broadly replaced by all that is newly conservative in art as in politics and society at large. This issue of Das Superpaper, Acid/Gothic, accompanies an exhibition that was filmed in Sydney’s Elizabeth Bay House at the end of May and held at Galerie pompom in August 2014. The premise of the title came about from a consideration of Acid (or psychedelia) and Gothic as cultural strategies that have reappeared throughout Western history in response to authoritarian or highly structured theoretical regimes. These strategies, when placed next to each other, became a lens through which to view the world. These last decades become a kind of torrid cheese dream, a nightmare had by someone who awoke in the Middle Ages and passed out sometime towards the end of the 20th century. At its core, this project is concerned with pairing things, with saying ‘these things go together, if only just for a moment’. The pairs in this project, spiralling out from the initial connection of Acid and Gothic, don’t exist as stark absolute binaries; they don’t exert the guiding influence of north/south, the moral influence of right/wrong, nor the scientific absolutism of true/false. A world of absolutes is not representative of how I navigate (here/there), how I remember (now/then) or how I relate (you/me), nor is it representative of a world I would want to live in. The formal pairings born from the conjunction of Acid and Gothic form relationships that are ambivalent, unclear, distorted, at times romantic and often consciously uncertain. Rather than existing as coherent, independent entities, they have blurred edges, they seep into each other, merge and shimmer. In this way the pairings exist as iterations of themselves, as might a shadow or an echo or a memory. The formal qualities and history of cinema have been key to the development of this project – in particular, through a consideration of the influence of cinema on the way that we form memories. Cinematic moments act to graphically and textually associate disparate events, works and lines of thinking. In 1993, Jurassic Park’s dashboard cups rumbled not only with the coming of the T-Rex but on a personal scale, with my own coming consciousness and on a grander scale, with the approach of the new millennium, the Internet and hyper-connectivity. In the exhibition these two rippling cups, stuck on repeat, become quotation marks that, alongside the glasses of W. C. Heda’s Still Life With Ham (1635), mark out on one hand the journey of Enlightenment and on the other the journeys of the Gothic and of psychedelia. If the cinematic is a central subject of Acid/Gothic, it has been equally important to its production as an object. 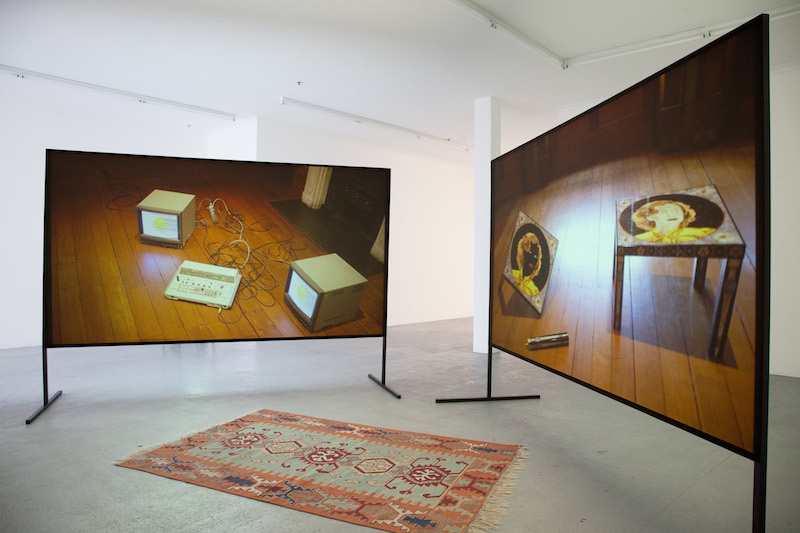 On entering the gallery, passing through a hall, the main space is empty but for two screens facing each other and a Persian rug aligned between them. 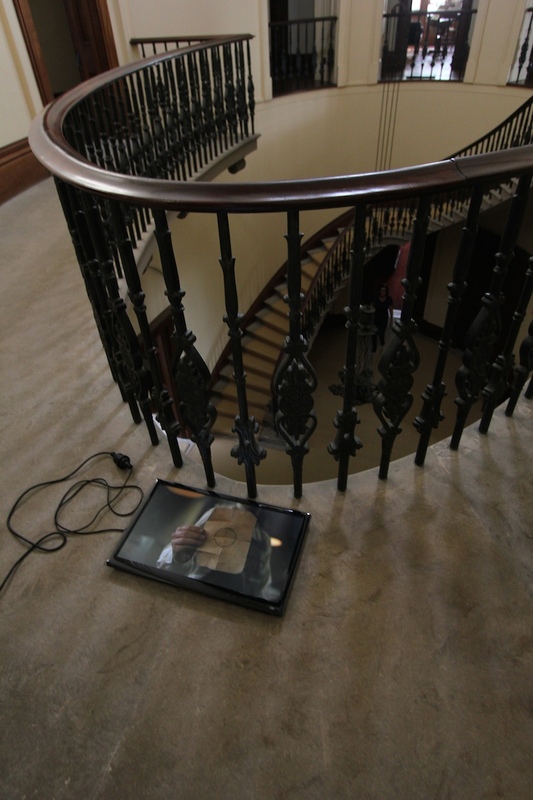 The two video channels show different points in a 20-minute loop that walks through an exhibition installed at Elizabeth Bay House. The loop is shot from the perspective of a traveller walking through the historic home, stopping to look at the various artworks and the architecture. 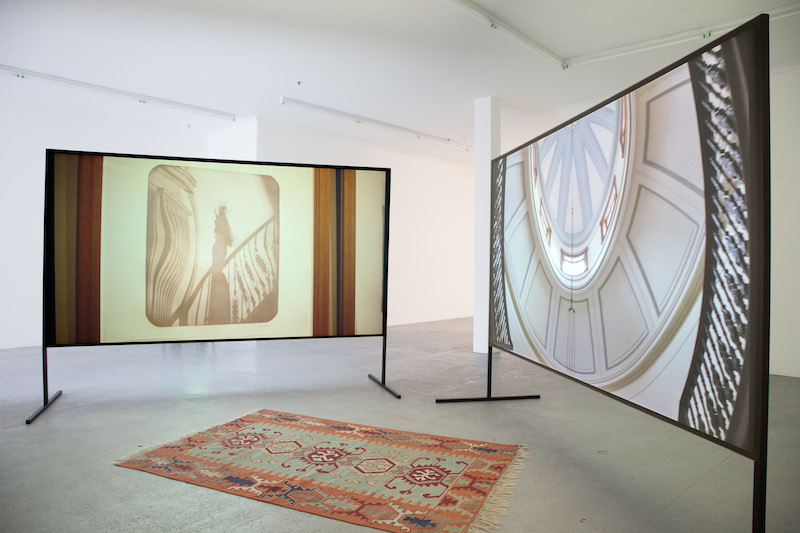 At times we see the traveller from later in the loop enter the frame; the viewer becomes the viewed and, across the two channels, the artworks can be viewed from two different perspectives and from two points in time. The score for the journey the camera takes through the space was choreographed, in response to the show and the architecture, by Jess Olivieri. The camera loops around the house’s famously striking elliptical saloon staircase, along the banisters of the upper arcade and throughout the rooms. The presentation across two channels becomes, in part, a jerky appreciation of Russian Ark and The Shining. Elizabeth Bay House was built by Alexander Macleay between 1835 and 1839 from designs interpreted by the colonial architect John Verge and was often introduced as ‘the finest house in the colony’. In situating Acid/Gothic in this Greek Revival (or rather Greek Revival Revival) mansion, the central saloon acts like an iris or vortex, analogous perhaps also to the cinematic spool. It exists as a cultural site both associatively, through its form, rhythm and proportion, its lighting and furnishings, and geographically within the physical and historical landscape of Sydney and Australia more broadly. The house has its own Revival pairing in Vaucluse House, the Wentworth family’s unfinished Gothic mansion several kilometres away in Vaucluse. Indeed, the story goes that William Wentworth had on occasion ended up drunk at the steps of Elizabeth Bay House hurling abuse at Macleay, forever tying the two houses in some half-forgotten affected landscape. Perhaps though, Elizabeth Bay House would be more appropriately situated against Harry Seidler’s Grosvenor Place in Sydney’s CBD. Opened in 1988, the bicentennial year of Europe’s grasp on the continent, the curved skyscraper enjoy a simple rhyme with the finest house in the colony. There are formal and poetic resonances between the two buildings’ plans and locations: both were built around an elliptical core, one with a square frame, the other framed by a pair of segments of a circle, and in true Sydney fashion, both floor plans were designed to make the most of the view. Both buildings pivot off the same reference point, the same hinge; like the same pendulum 150 years apart, they are attached to the same anchor, the same vanishing point that lies between the heads of Port Jackson. In setting their sights on the heads the buildings gaze not only toward the rising sun but outward, away from Australia, as though yearning. In taking Acid and Gothic as cultural trajectories that can be followed and intertwined, Acid/Gothic tries to imagine alternate realities; it traverses time and space and promotes a world where relationships, ideas and social and cultural frameworks exist on an expanded plane, in multiple dimensions and careening off in multiple directions. This issue of Das Superpaper looks to emotional, experiential and, above all, uncertain stances on existence, the cultural fabric and the eternal task of living with each other. Filmed at Elizabeth Bay House, courtesy of Sydney Living Museums. Through Das Superpaper, this project has been assisted by the Australian Government through the Australia Council, its arts funding and advisory body. Ron and George Adams, Samantha Ferris and the MOP Projects board; Jan Conti and Angela Sanfilippo (Sydney Living Museums); Anita Beckers (Galerie Anita Beckers) and Idis Hartmann (zkM Center for Art and Media karlsruhe); nova Milne; Andrew Jensen; Roslyn Oxley9 Gallery; Robyn Stuart; flat screens loaned by Performance Space and 4A Centre for Contemporary Asian Art. (exhibited: holezits and holebody, not exhibited: holefood and holeshots) Commissioned for There's a Hole in the Sky, curated by Tom Polo at Campbelltown Arts Centre. The Hudsucker Proxy, 1994, (111 min) Driected by Joel and Ethan Coen. 2-channel video with sound, 17:58 minutes (looped), double-sided screen, aluminium stands and frames, rug. Read: If only for a moment, a text on on Acid/Gothic in West Space Journal, Issue 4, edited by Sarinah Masukor and Gavan Blau. Read: Exhibition preview on The Art Life by Stella Rosa McDonald. Read: Exhibition review on Concrete Playground by Annie Murney.